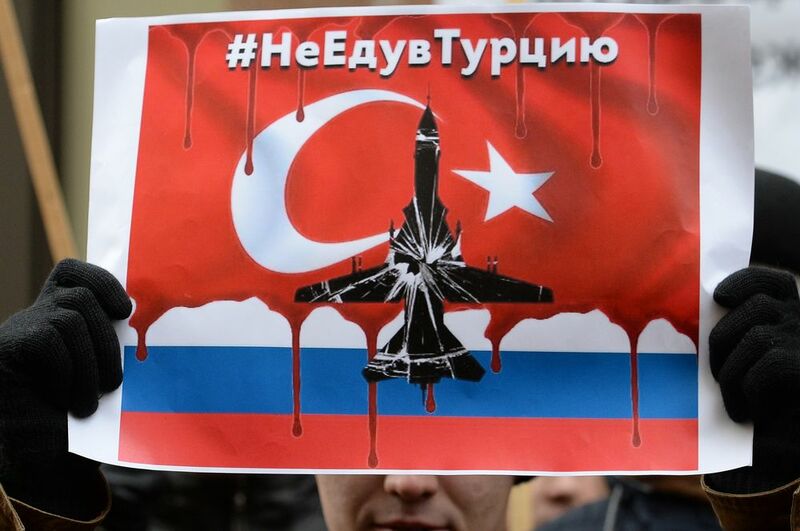 A protester against the actions of the Turkish Air Forces at the Turkish Embassy in Moscow, that reads "#Won'tGoToTurkey". The number of Russian tourists to Turkey has fallen tenfold, said Cetin Osman Budak, deputy head of Turkey’s Republican People’s Party on May 5, according to Russian news website Sputnik. Russia suspended charter flights to the country's resorts after the Turkish Air Force shot down a Russian Su-24 in November 2015. "Over the first four months of last year , 126,690 Russian tourists visited Turkey, and this year  — only 12,039 people," Budak said, noting that Ankara's aggressive policy has led to the general decrease in foreign tourists visiting the country. The number of tourists from Western Europe declined by 12.8 percent in the first quarter of 2016, according to the report of Turkey's Ministry of Culture and Tourism. The number of tourists from Germany decreased by 17.2 percent and the overall number of tourists from EU countries dropped by 13.8 percent. At the same time, the number of tourists arriving from Georgia (+36.4 percent) and Ukraine (+26.7 percent) increased significantly. Tourism accounts for 4.5 percent of Turkey's GDP and plays an important role in reducing the government's deficits, Sputnik reports.